The first "Crackdown" was a nice surprise. It came seemingly out of nowhere and offered up fun, over-the-top, open-world gameplay that was a refreshing change of pace. You could throw cars and climb to the top of skyscrapers. It was a game that truly made you feel like an overpowered superhero. So how do you top that feeling of power and freedom? The new game takes place in the same fictional Pacific City and you once again take control of a superhuman officer from The Agency. The city is still overrun with gun-toting gangs, but there is another menace running rampant: mutants. 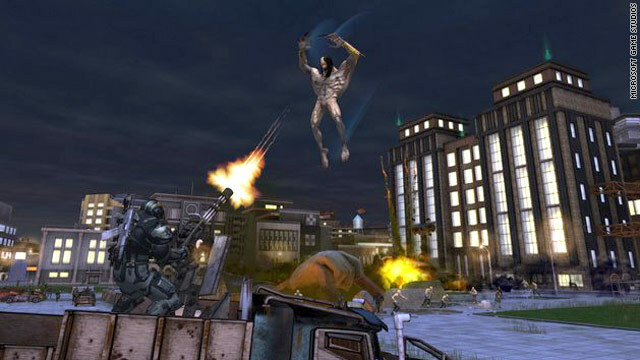 These genetically altered creatures roam the streets like zombies and add a new dynamic to the gameplay, as they are only affected by certain weapons. Regular guns still abound and work just fine for taking care of criminals. But the mutants require special UV weapons that don't affect normal humans, at least not in the same way. The UV gun we had the chance to play around with was very effective when it came to taking out mutants, but you couldn't kill humans with it. Instead, it would launch them into the air, temporarily stunning them. It's a great tool for giving yourself some breathing room when there's a large number of enemies surrounding you. But, of course, the real joy of fighting against zombie-like creatures comes from mowing down the hordes. And "Crackdown 2" lets you do this in spades. At one point during the demo which consisted of the first 45 minutes or so of the single-player campaign we were able to make a detour to an area of town where the streets were literally crammed full of mutants. This led to a fun-filled few minutes that were very reminiscent of the parking lot segments of "Dead Rising" and involved nothing more than running over mutant after mutant. The zombie-esque mutants could easily be nothing more than a gimmick, but they actually seem to fit in the "Crackdown" universe. In a world filled with super-powered cops leaping from skyscrapers, throwing in a few filed lab experiments doesn't seem like much of a stretch. But aside from the mutants, "Crackdown 2" feels almost exactly like its predecessor. It looks the same, controls the same, and has basically the same set-up. Instead of reinventing the wheel, the developers at Ruffian Games have decided to stick with what works. "Crackdown 2" goes the bigger-and-better route, though few of these changes were apparent during the early portions of the game we played. But the developers have promised more customization, enhanced upgrades that let you run faster and jump higher, and new vehicles to race around in. The buildings are taller and there is even a subterranean element to Pacific City this time around, so the game will maintain its emphasis on verticality, which should please those with the urge to hunt down every last agility orb. Surprisingly, "Crackdown 2" also has an increased focus on story, at least early on in the game. The opening sequence is presented as a television news broadcast and feels like a deleted scene from "Resident Evil Degeneration." Of course, in a lot of ways the first "Crackdown" actually benefited by having a bare-bones narrative that helped put a greater emphasis on the action. Whether or not the expanded story will be a positive for the sequel remains to be seen. From what we saw, it looks like "Crackdown 2" will deliver exactly what made the first game such a sleeper hit, only more. And with zombies. The game will be coming exclusively to the Xbox 360 on July 6.